I'm gearing up for my month by the sea. It starts this Friday. Hooray!!!. I can't wait but, in the main-time. there are so many things to be taken care of. Don't you just feel that the last few days before your vacation are always the most demanding, tiring and long? This year, Georgie, Psipsini and I will be going to the place were I spent all my childhood and early adulthood summers, Fourka Beach, a long sandy stretch of beach in the middle of the west coast of the Kassandra Peninsula of Chalkidiki. To say that I just love this beach feels like an understatement. I feel safe and at home when I'm there and I can really let go and relax, enjoy the simple pleasure of an early swim in the crystal sea, a refreshing iced tea under the umbrella, a plateful of oven roasted anchovies. 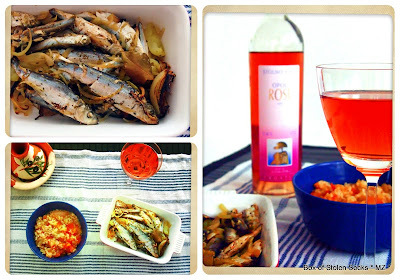 Fresh anchovies are a staple of the Greek summer table. They are cheap and quite versatile. Roasted with tomato and onions, grilled with lemon and oregano, fried coated in flour, marinated in vinegar and garlic, there are so many ways to enjoy them. I roasted mine with onions, peppers, capers and laurel and served them alongside a brown rice, tomato and oregano risotto. Brown rice doesn't have to be a blunt, wintery food. It can be transformed by adding a little bit of oregano, fresh tomato and onion and hey presto you have a light nutritious summer meal smelling and tasting of the Mediterranean sea. Wash the anchovies and spread them evenly in a heat-proof baking pan. Mix in the peppers and the onion slices, the capers, laurel and olive oil - I mixed everything together using my hands so that the fish were covered with the olive oil. Bake in the oven for 30 minutes. Cook the rice in the water until it is ready - about 40 minutes. Add more boiling water if needed. In a pan heat the olive oil and lightly brown the onion, about 4 - 5 minutes. Then add the tomato and oregano. Add the cooked rice to the tomato - onion mix and heat through. Anchovies...hmm...at least they look tasty. I know they are not everyone's "cup of tea" :) but they were tasty and brought me closer to vacation time hooray!!!!! !